Abigail has always enjoyed making things. Even before the winter made her nose start to leak like a sieve, we went through boxes of tissues at a truly insane rate. Why? 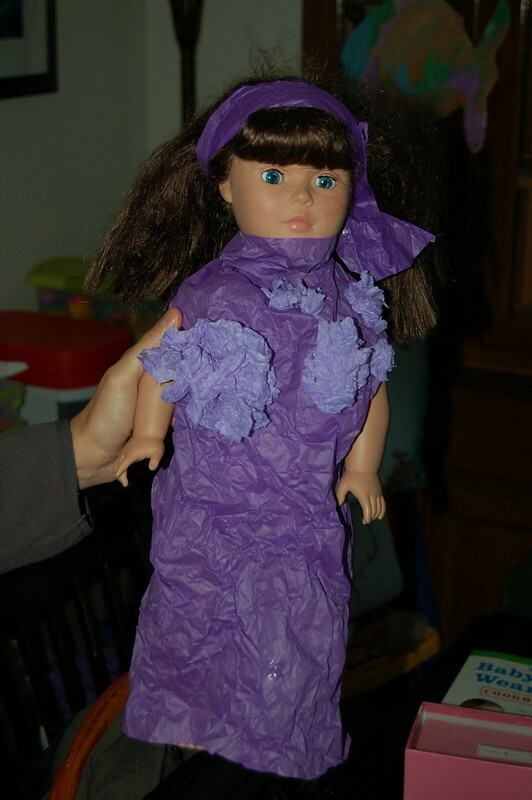 Because she had to do things like make dresses for her dolls. Or for the cats. Maggie usually gets away with just a towel on her back but her tissue work can be quite impressive. 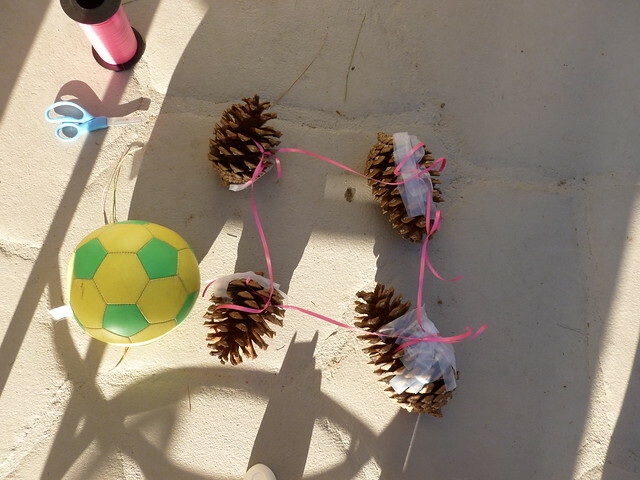 This was one of the first major projects she completed on her own, just after she turned four. The only thing she got help on was the puffs on the front, which her mom helped her attach. Other than that, this was all her own work and design. We still have this thing. It was built to be taken off and on. I don’t know what this is. But the point is she’s always making things. The fact that some of them aren’t the most inspired misses the point. This past weekend we went to the Children’s Discovery Museum in Escondido. They had a shop and she selected two items to purchase. One was a maker’s kit filled only with fasteners, hinges and a “safety” saw for cutting and punching holes in cardboard. I’m very keen to see what comes out of that. 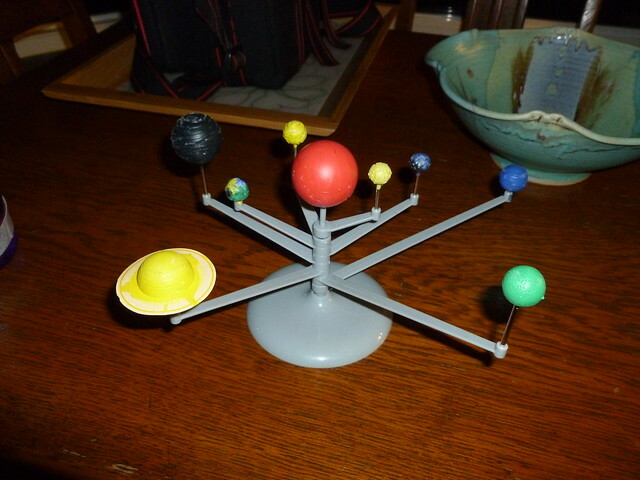 The other item was a model of the solar system. We built it that same day. I helped her snap the pieces together and she painted it. Here’s how it turned out. While I’m a big fan of the all-black Jupiter, most of these planets are fairly one-note. Single colors for each of them. But let me zoom in on the Earth for you. LOOK AT THAT EARTH! LOOK AT IT! I did two things to help out with the painting of the Earth. I told her to look at the globe behind her, which she did, grudgingly, for a second. 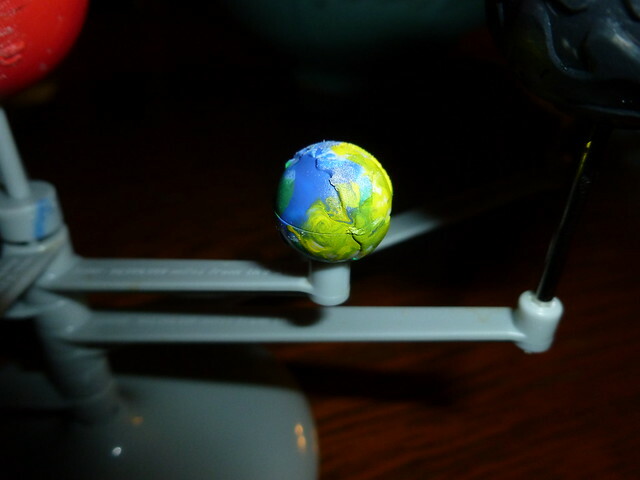 And I held the little planet on a stick, rotating it to give her the best angle. I even questioned the color choices she was making as she went. I don’t think I could have painted an Earth that well if I’d tried. The thing is the size of a bean. All I’m really trying to say is that my daughter is awesome and will rule the world some day. This entry was posted in Abigailia and tagged Earth, High Art. Bookmark the permalink.